The first time I ever saw Hingle in a role, it was on a Sunday afternoon when I was a wee small kid and WFMY out of Greensboro aired Hang 'Em High, with Hingle as the judge who makes a marshal out of Clint Eastwood. But Pat Hingle was a character actor whose repertoire went far beyond judicial types. He also won wide acclaim as the father to Sally Field's Norma Rae, and he enjoyed a particularly nasty role as Mr. Hendershot, the owner of the truck stop in Maximum Overdrive. It was while making that film that Hingle discovered the coast of North Carolina, where he wound up making his home. 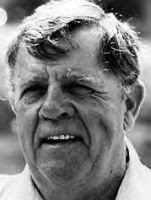 And that is where Pat Hingle, world-renowned character actor, passed away over the weekend at the age of 84 following a two-year battle with a blood disorder.